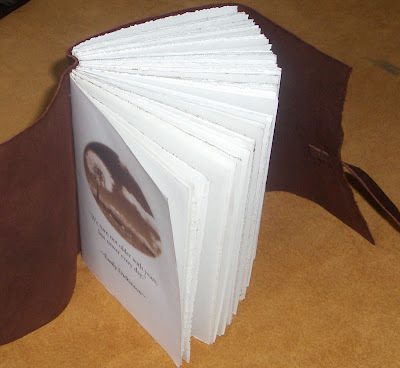 The next of our swap books to be revealed is this soft leather journal made by Bev, of LaPaperie. 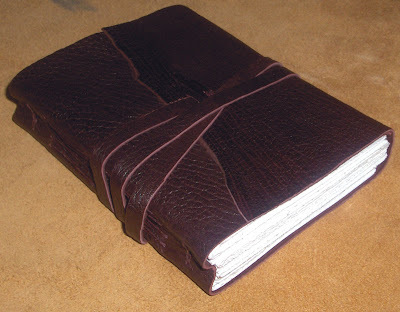 The wrap-around leather cover is burgundy goatskin and the journal is bound using longstitch and chain stitch; sewn through the cover and visible on the spine in an X pattern. Bev has embellished her blank journal with an image and a quote by Emily Dickinson on the first page. Visit LaPaperie.Etsy.com to see more of her work. Lucky you indeed! It's beautiful. Thanks so much you guys. It was a joy to make! Beautiful book! I really like your literary journals--they're lovely.